We enjoyed a family holiday with both the Eides and Bulthuis' We are fortunate to have so much family in Lynden. 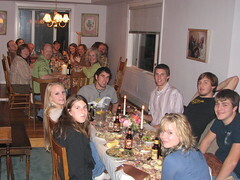 Jenny's family also came up to Lynden, so they joined us for the Eide turkey dinner on Thursday. Markus brought an SPU friend, Scott, from Colorado who joined us as well. Mike and Marti hosted the feast which included oyster stuffing for the hearty Norwegians. Instead of shopping on 'Black Friday,' we enjoyed a walk at Boulevard Park in the sunshine. In the evening, we celebrated with the Bulthuis' at Doug and Pam's. Jack and Sue were up with Aaron and Jen, and Ellen spent the week with mom. It was good catching up and celebrating God's goodness. We also visited with Anna and girls who came up from from Tacoma, and longtime friends, Frank and Cynthia. On Sunday morning we visited 'Vintage 242' Bjorn and Jenny's church that meets in a movie theater in Abbotsford. The church is part of the Acts 29 church planting network, and Bjorn and Jenny are very involved in serving - Jenny with children's ministry, and Bjorn with music, AV and developing the web site. It was great to visit with so many family and friends.